Grand prix, golf, boutiques et restaurants! Bienvenue sur notre 4 BR 2489 sq ft Big Island maison, située à kamilo, une station privée dans la célèbre station de Mauna Lani! Notre cuisine gastronomique est équipée avec des armoires en acajou africain, Thermador appareils en acier inoxydable et des comptoirs en granit. Jusqu'à 10 adultes peuvent être logés confortablement dans 2 chambres à coucher principales avec lits king-size California, salles de bain privées et placards de plain-pied; un 3ème BR avec lit CA King et 4ème BR avec un lit queen et un lit double. Nous avons remplacé la cloison de notre 4ème chambre par un mur et des portes-fenêtres offrant une intimité totale. portes de poche ouverte le grand espace de la salle de séjour à la véranda supérieure avec Wolf grill. Toutes les chambres ont téléviseurs HD 32 '' et un lecteur de DVD avec le câble numérique. La grande salle est équipée d’un téléviseur HD 48 '' à DEL 1081p, d’un lecteur DVD Blue Ray, d’un décodeur HD et d’un système stéréo à son surround (5.1 Dolby). Nous avons 2 vélos de villégiature de taille adulte et avons ajouté une voiturette de golf dans le garage à l'usage de nos clients. 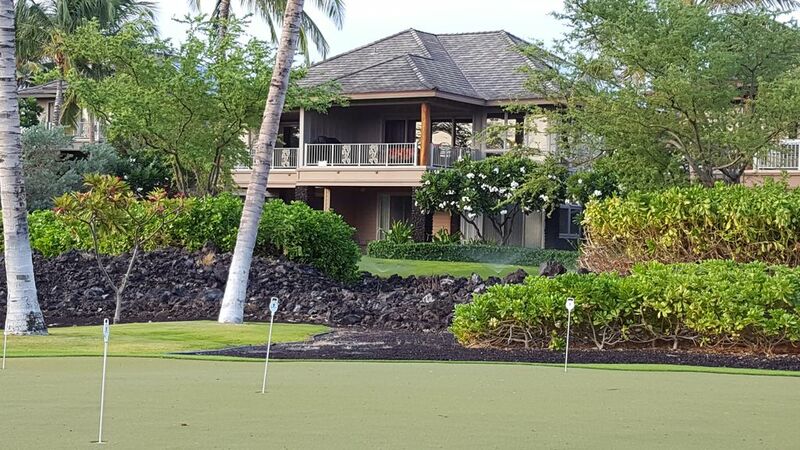 Commodités locales: golf et tennis sont disponibles au sein du Mauna Lani Resort. Les hôtels Mauna Lani Bay et Fairmont Orchid disposent de spas magnifiques et ne sont qu’à quelques minutes. (Le Mauna Lani Bay Hotel sera fermé pendant 14 mois pour rénovation à partir d'octobre 2018. Waterfront Activities Center idéalement situé sur la plage du propriétaire. Contacter le propriétaire sur les frais resort de golf. Ecrire propriétaire pour plus de détails sur les agréments et les activités locales. Le Ka Milo Recreation Center se trouve à 3 minutes à pied de notre porte et dispose d'un état de l'art centre de remise en forme avec salle de gym et piscine de olympique junior, deux bains à remous, piscine lagon avec bassin pour enfants peu profonds, des chaises longues, tables de jardin et un pavillon couvert avec des sièges et la cuisine en plein air pour les réunions de groupe. Notre clé du centre de loisirs est à la maison pour nos clients à utiliser l'installation. The Fairmont Orchid Resort and The Shops at Mauna Lani sont à 10 min à pied. Le Mauna Lani Bay Hôtel and Beach Club Propriétaire sont 2-3 lecteurs de mile de distance. Notre carte d'accès est à la maison pour les clients d'accéder à la plage du propriétaire. Ces sites offrent de nombreux restaurants, des boutiques, un marché de la gastronomie, location de DVD et accès à la plage et les activités, y compris l'observation des baleines en saison. Numérique à la télévision dans la grande salle, d'autres téléviseurs avec câble de base, chacun avec DVD. Propane Loup Grill avec des ustensiles. We thoroughly enjoyed out stay at Tom & Laura's home. Our party consisted of three couples and two teenagers. Finding three King/Queen bedrooms & a fourth with two beds was a challenge, this home suited our party well. It was clean and well stocked. The beach supplies in the garage were appreciated. The Ka Milo Recreation area is lovely with two beautiful pools & hot tubs; the pools however were too cold (in February) to use. (The area we frequently stay in heats the pool at night so it's usable in the winter.) We would definitely choose this home again when temps are higher & pool is not so chilly. Owner communicated well and promptly. The area at Mauna Lani is beautiful and a good place for walking/running. Snorkel Bobs and a small grocery store are close. There are many good restaurants in the area. We enjoyed the beach bar at the Fairmont Orchid. If the pool had been heated we would given a 5 star rating. Beautiful, clean, maintained extremely well. The pictures do not do it justice. It was the perfect day for a vacation. House was beautiful, great views. Unfortunately 2 of the 4 toilets had plumbing issues that owners knew about, and no repairman to fix. I ended up going to the hardware store to fix myself, roughly 3 hours of vacation time gone. For my time the owner sent $100. The master bathroom tub does not work, owners know about this as well, ask if plumbing issues are fixed before renting. No coffee maker, asked if one could be dropped off, response was for us to go buy one. Quiet neighborhood, peaceful, not many permanent residents, mostly vacationers. One of the neighbors is a peeping tom. Keep your blinds closed, I had to confront the neighbor when he was walking around the house at night. I have two daughters and this does not fly. Told owner, he knows. The neighbor then told us he doesn’t like the owner of this house and that he hates vacationers in his neighborhood. Strange. Not my style of vacation rental, for a few bucks more a night I would recommend Mauna Lani villages or Mauna Lani golf villas. This neighborhood, Ka Milo, has a few quirks to work out. The other two I’ve stayed at and enjoyed. This was a very unfair review. What this guest failed to mention was that they had a party at my house with their local friends and family and their guests blocked the road in front of my home. Pictures were sent to me the next day by HOA asking me to remind him not to do this again. A neighbor, who happened to be a board member, came over to my house and looked in window beside door to see if anyone was there and to ask them to move the cars. He is not a peeping Tom but actually a CEO who is a part time resident. He did have bad luck with plumbing. One toilet broke a chain for the flapper valve. I told him that I had that fixed a month ago and was surprised that it happened again so soon. The other toilet had a drain valve that apparently broke. He decided to drive to nearby town to buy a replacement and fix it himself (without telling me or asking me for permission.) Fortunately, he did it properly. When he told me, after the fact, I offered him $100 for his trouble. The coffee pot broke while they were there. They wanted it replaced by the next morning. My property manager wasn't able to replace it for 24hrs. I told him that if he needed one sooner he could pick one up, if it was convenient for him, and I would reimburse him. The bathtub works fine. A water pressure valve in front of our home was whinning so my neighbor took it upon himself to "adjust" it to stop the whinning. Apparently, he inadvertantly turned down the water pressure. He was very sorry when I told him that it dropped the water pressure in my master bathroom and promised never to touch that valve again. He also didn't mention that he left somethings behind after check out and asked to be let in remotely. This is not usually risky because renters are not likely to take TV's or large items on airplanes. However this guest has a local 808 area code and local friends/relatives. Some vacation home owners have had valuable items stolen when locals backed trucks up to their home and helped themselves. None the less, I trusted him and permitted it. Then I realized that he left my front door unlocked. When I told him, he apologized and promised to return to lock it within 2 hrs. It took him more than 24 hrs to return to lock my home. After this behavior, and his back stabbing review, I would never rent to him again! The house was roomy. The view was disappointing, obstructed by construction. The furnishings were adequate but could be updated or refurbished. The house had clearly not been cleaned between renters; the fridge was filthy, the toaster coated in crumbs, the blender with residual of prior use, utensils in draw had to be washed before use, and a leftover cleaning towel left on the living room end table. The batteries in the TV remote needed to be replaced. The smoke detector batteries not replaced and failed during the stay--on a pitched ceiling to high to reach and we had to wait till the next day to be attended to (try sleeping with the constant chirp of the alarm, in any bedroom much less the den turned into a bedroom separated only by an accordion door). The Mauna Lani resort area is lovely. The residential areas are quiet. When I shared this review with my cleaner, she nearly quit. She said that she absolutely cleaned the home before this guest's arrival and can't understand why he would lie or exaggerate so much. I sent this guest an automatic email on the day of his arrival, asking if there were any problems and he never responded. If he would have said that it hadn't been cleaned to me then, I would have sent the cleaners out immediately to investigate. He didn't say that he felt the house wasn't cleaned until he had been there a few days. She has never had this type of complaint at my home nor any of the other homes where she cleans. In fact most of the time the comments on her cleaning are very good. It takes her between 6-9 hours to clean my home between guests. She felt devastated by his remarks. The view from the lanai has changed. Instead of looking upon a large area of flattened volcanic rock, now there are completed homes, beautifully landscaped grounds and a practice golf putting green. One recent guest said that she nearly didn't rent with us because she thought that the view from the lanai was so drab in the pictures. She was very pleasantly surprised to see the landscaping and completed homes and felt it made it look much, much better. I am waiting until the last home is completed to hire a videographer to capture the much enhanced view from the lanai. The only incomplete construction in the view from the lanai is a home with the outside nearly completed and that is less than 5% of the lanai view! We still have a great sunrise view of the sun rising over Mauna Loa and Mauna Kea from the lanai! Yes the battery died in a smoke alarm that is mounted high in the vaulted ceiling, beyond the reach of my 8 ft ladder. I regularly change all of the batteries in the smoke alarms that are within my reach. This one required a service call from a handyman ($100) to bring a ladder tall enough to reach. He came the morning after I was notified. I doubt that you will find a better response than that on the island in most vacation homes. I used to ask my cleaner to pitch everything from the refrigerator between stays. She said that other homes leave condiments in the refrigerator. We tried that and have received numerous notes from guests thanking us for having condiments in the refrigerator. My cleaner cleans all of the other shelves between each rental. Our party of 8 (6 adults and 2 kids) stayed here for 5 nights and could not have been happier with the setup. This home has been set-up so that visitors want for nothing during their stay, with all TV's having cable access, great quality wifi throughout the house, lots of condiments & spices in the kitchen to cook with, beach gear, access to the beach club...the list goes on and on. Communication with Tom was very fast and clear. The only issue with our stay was that the time we spent there went by far too quickly. I would not hesitate to stay here again and can highly recommend this property to anyone that might be thinking about staying here. We LOVED our stay at this amazing house. From the moment we walked in the door we felt right at home. The house was equipped with everything we needed to enjoy home cooked meals while on vacation. The view was spectacular off the lanai. We all enjoyed our coffee and cocktails out there. I would definitely stay here again. Tom was quick to respond to any questions or comments. Will recommend this house to my friends and family. 269-469 Vary by season Write owner to for info on multi-day discount or if early check in or late check out are available.